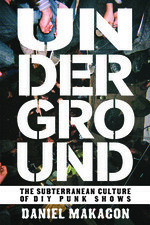 Book Review: Daniel Makagon, "Underground: The Subterranean Culture of D.I.Y. Punk Shows"
Nonetheless, Daniel Makagon knows; he was there and has experienced it all firsthand. Which is crucial to this book’s impact. It’s coming from an insider; one who has seen it, heard it and lived it. And by putting it all so straightforward, it makes the validity of his stories and what he relays from the musicians interviewed and their recollections even more poignant. In a word, if you are in a band – or thinking about starting one – and want to work your way into a scene, you really must get this book and read it, end to end. It’s a necessity. Call it mandatory reading.